The Old Orc is an Orc bandit who can be randomly encountered with two dead sabre cats near him at an exterior location after you reach level 5. If spoken to, he will say that he wants a "noble death", which the Daedric Prince Malacath has promised him, and asks you to deliver it. You may oblige, in which case he will attack you. There is no reward for killing him, except for the experience you will gain if you defeat him and the objects you can take from his corpse. Killing him does not constitute a crime. If you refuse, attempt to talk him out of his death wish, or disengage from the conversation, he will suggest that you leave him so he can wait for his wish, or otherwise do nothing. He can, for some, present a moderately challenging battle. Speaking to the Old Orc will have him say: "I am waiting for a good death" on your first interaction with him. This will give you the option to either ask him why he wants to die or what he means by 'a good death'. Ending the dialogue and speaking to him again will have him instead greet you by saying: "If you are not here to grant me a good death, then you can leave." You will be given several additional branching dialogue options to respond with. You can now also (unsuccessfully) try to convince him that he is not old, say that you cannot think of a way to convince him otherwise and will leave him to his business, or offer to help. Asking him what he means by a good death will have him say: "Yes. Were I to simply lay down and die, it would not please Malacath." Asking him why we wants to die will have him respond by saying: "My time has come. I am old. Too old to become chief. It would be wrong for me to take wives at this age. So I will die. Malacath has given me a vision of a glorious death. I am to wait here until it finds me. As you can see, it has not yet arrived." Telling him he is not old and is still capable of living life will have him say: "Indeed. One should find his death while he can still call himself a proper man. 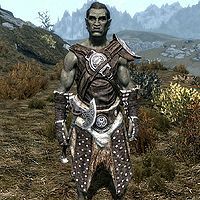 We Orc men are not like these Nords and Imperials who carry on until they are grey and feeble and their hair falls out. To cling to something past its usefulness is unseemly, how much more so when that thing is you?" If you admit to him that you will not be able to convince him out of this and will leave him to his business will get the response: "You should leave. I don't want you scaring off my good death." After saying this, he will end the conversation. If you tell him that you could give him the death he seeks he will consider your proposition while giving you an opportunity to back out of the fight before it starts: "Perhaps... Are you sure about this?" Taking this opportunity to avoid the fight will have him tell you to leave the same way he did before. Taking the other option and confirming that you will kill him he will respond: "Hmm. We shall see." With this said, he will proceed to fight you to the death. His script notes describe him as an "old warrior sitting patiently waiting for a good death after a good fight". There was a similar encounter with the Orc Umbra in Morrowind. The wilderness encounter "A Good Death" does not properly unload and remove him and the two sabre cats if you kill him, or if you ignore him and leave the area. This page was last modified on 1 September 2018, at 07:40.